I just cannot understand how automakers take steps backward with certain features and think it's a smart idea. If it's a cost thing, then offer them as options or dealer-installed items. Yeah. I agree, although I think part of the cost is around the wiring to feed those extra features. Not sure if they still do this but they will only outfot wiring harnesses with connections for available features. 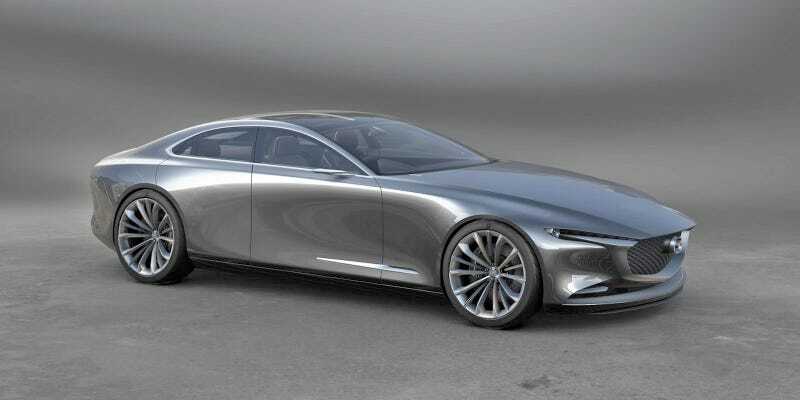 The next Mazda 6 is supposed to be RWD. According to rumours, the base model engine will be the Skyactiv-X 2.5L and the upgraded engine will be a Twin-turbo 3L V6. I am hoping they will make a Skyactiv-X inline 6 version of their 4 cylinder though. Manual transmission for the turbo engine. How about a Speed6 with some real performance credentials? And make it available in some trim levels other than $40,000.00 Mega-Signature GT DeLuxe...you know, so the rest of us can have a little fun too. Wagon, turbo, manual. Don't care about AWD. Same thing most people have wanted form the 6 in the states. Bring me a wagon in Touring trim or higher with a manual and I will stop what I am doing and get one. Bring me a wagon with a manual and I don't care if I have to roll my own windows down, I will get one. Nobody likes to buy upper trim levels in these sort of cars with a manual transmission, unfortunately. Plus Mazda would've likely had to beef up their manual trans for the 310ft/lb of torque which they saw no point in doing. The revival of Mazdaspeed... If I had a dollar for everytime someone would mention this, I'd be riched. It has been talked about all over to death. Really sad to see that Mazda does not intend to continue building performance cars. They are focusing their rather limited budgeting toward a different direction to maximize profits - focusing on building good crossovers and SUV's to satisfy the north-american market and continue building their name here. I'd like it to have a simple, minimalistic interior, 3 litre straight 6 engine, and also to come in coupe body style, two doors, no B pillar coupe. What I would really love to see, and I don't think anyone mentioned is a possibility to choose between things when ordering a new car, such as old school key ignition vs start button, manual seats vs electric in all trim levels, metal vs glass sunroof, steering wheel without buttons vs one with, regular cable handbrake vs electronic one and such things. Sort of a purist version of the car. I wouldn't like to see downsized engine and too many screens, ambient lights and such. There is absolutely nothing wrong with analogue instruments and physical switches. Now, when I read what I've written it's obvious that I want a new RX-7 FD with a straight 6 engine. A new Mazda 6 that is a bit like MPS (Speedsix) and a bit like RX7 is actually a really good idea. The base engine should be the 2.5L skyactiv x, and the upgraded engine should be a 3.8L straight-6 version of that same engine. An inline 6 would respond very well to the compression ignition and supercharger. I agree with what you said about the purist version, but I highly doubt something like that would make it to production in todays day and age. All Mazda RX vehicles must have a rotary though. I agree for 2.5, but I believe that 3.0 6 cylinder version of 2.0 liter Skyactive X would be more palatable and more realistic. 3.8 is like... to good to be true. I agree, but we can dream. When I was young, I couldn't afford the cars I wanted. I still want the same thing, but now they don't make them anymore, and I'm too old to get into restoring old cars. RX, I completely, unequivocally agree. Mazda did make 626 couple, however. And 929 coupe, too. Those were the days. Hey, its a "wish list." If all I wished for was what they wanted to make...what would be the point?